Chocolate tofu filling is a rich and creamy pie filling that can also be used for other desserts and sweet treats. It is simple to make at home, and you can add other flavors for different twists on the basic recipe. Tofu is a wonderful ingredient to cook with, as it doesn't impart much of a flavor on its own into dishes. Instead, it takes on flavors of other ingredients. Silken tofu can be blended into smoothies and other drinks, so it makes the perfect base for any sort of creamy dessert, where one would normally use heavy dairy products. Since silken tofu is a neutral white color, takes on a rich texture, and chills to a firm state, it's the perfect ingredient for traditional cream fillings without using animal products. To make this tofu filling, you only need a few simple ingredients. Here's the recipe, which makes enough to fill one standard-sized, graham-cracker pie shell. In a blender, mix the silken tofu with vanilla and sweetener, if using, until smooth. Place chocolate chips in a saucepan on low heat and melt just until smooth. You can also do this in a microwave-safe container, microwaving at 30-second intervals. Stir the mixture after each interval - do not overheat. Pour melted chocolate into the blender and continue blending until the mixture is completely smooth. You can then fill a prepared pie crust with the chocolate filling, and refrigerate until firm. This delicious, creamy filling can be used for lots of different desserts. Here are just a few suggestions. Use it to fill pastry shells, or as a filling between cake layers. Serve it in small dishes, like a chocolate mousse or pudding, garnished with fruit and whipped cream or whipped cream substitute. Pipe it into purchased or homemade chocolate dessert cups. Freeze the filling and scoop it out like ice cream. You can transform this easy dessert into something a little more complex in flavor with the addition of spices, extracts, and even fresh fruit. Try these additions to kick up your basic chocolate tofu filling. Add a few drops of extract, such as mint, almond, or coconut. Omit the vanilla, and add the extract a little at a time until you reach the desired flavor. Toss in a ripe banana while blending. The banana won't change the consistency of the filling, and it goes well with chocolate. Try adding spices like cinnamon or nutmeg. For an adults-only dessert, a splash of flavored liqueur is a nice touch. Peanut or other nut butters are a tasty addition to this filling. Whatever you decide to add to the filling, make sure that you don't add too much liquid, or it won't set very well in the finished dessert. There are always variations on any recipe. The chocolate filling can be made in different ways, and used in many different desserts. Here are some more ideas for this tasty treat. Chocolate Tofu Tarts - These tarts are decorated with toasted almond slices. Easy Chocolate Tofu Pie - This pie is baked and then chilled, and uses cocoa powder for its chocolaty taste. Vegan Chocolate Cheesecake - Add some vegan cream cheese, and the tofu filling becomes a cheese-less chocolate cheesecake. 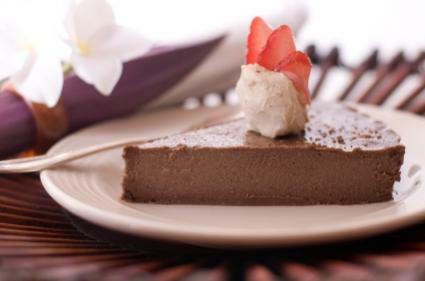 Chocolate Tofu Mousse Pie - The Food Network puts their own spin on this dessert. Their version includes egg whites, so it isn't suitable for vegans. Try making this chocolate tofu dessert for your friends and family. Don't tell them what it's made of until they're raving about how delicious it is! Then you can share your little secret.